"Absolutely mouth-watering! Impossible to read without some chocolate in hand." "As Auerbach becomes caught up in the lives of the shop owners and their employees, she serves up luscious literary goodies." 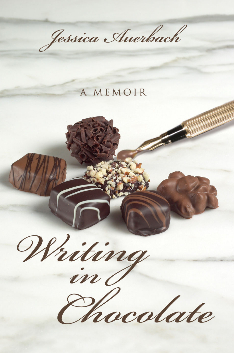 When Auerbach spends a year in a chocolate shop she learns much about chocolate-making but WRITING IN CHOCOLATE also uncovers the secrets of Auerbach's own writing process. Helen sits across the wide granite work surface from me while we roll candies. She’s making rum truffles, using a melon scooper to extract portions of ganache from the pan next to her. After she smooths each one into a perfect bite-size globe, she twirls it around in chocolate vermicelli—what most people call sprinkles—then drops the plump morsel into a fluted paper cup. Opposite her, I roll creams. My fondant is much firmer than her rich ganache, which, she explains to me, grows softer every minute it is out of the refrigerator. She has to be careful not to handle her truffles too much—the heat of her hands will melt them. I use gloved fingers rather than a scoop to pull enough sugar to form one candy. This is my first time doing creams, and Helen, the chocolate shop’s resident rolling expert, stands up from time to time and leans across the table to check my progress. She suggests using more cornstarch to keep the candies from sticking when I set them down. I smooth a handful of the white powder across the paper-lined tray and she smiles her approval. When Helen is seated again, she goes back to the story she’d been telling me. After thirty-eight years of marriage, her cousin’s wife discovered he was having an affair. And if that weren’t bad enough, the wife realized this wasn’t the first fling he’d had. It turned out he’d been having affairs their whole married life. From Day One, as Helen puts it, her eyes widening over the phrase. Helen, and all my co-workers, are constantly coming up with book ideas for me. They all know I’m a writer and that I’m here, in Deborah Ann’s Homemade Chocolates, to get myself some atmospheric details. Jane, who uses molds to make three-dimensional novelties, says she has an idea for a book. She suggests that a murder weapon could be hidden inside a hollow chocolate item and then the whole thing could be shipped off to some faraway place. “Cool,” says Olivia, one of the teenagers who works here. “A murderer could stick something in this, for instance.” Jane holds up the two halves of a giant chocolate Easter egg she’s just unmolded. “True, but it’d have to be a fairly small weapon,” I say, for as big as the egg is, it won’t accommodate anything like a long-bladed knife or a pistol. “Swiss Army knives,” says Eric, another high school student who works afternoons and weekends. “Did you know O.J. had a whole collection of Swiss Army knives?” He slashes through air with his hand a couple of times, a laid-back rendition of Zorro’s mark. “That would fit in one of your eggs,” he tells Jane. “But you know, technically, it’s illegal to put a non-food item inside an edible product,” Jane says. I happen to be aware of this particular health regulation because last week someone asked Jane to put an inedible object inside a molded chocolate ball and she’d had to seal it first in food-grade cellophane. The customer had given Jane a small rubber head that bore the gnarled features of an ugly gnome. Part of some ancient toy, perhaps. “Nobody likes it, so we’ve been trying to foist it off on each other for years,” the woman had explained. She wanted to mail it out to her unsuspecting daughter in the Midwest. Now I point out to Jane that she probably doesn’t have to worry about this edible/inedible issue where murder weapons are concerned because a person who was willing to commit such a crime wasn’t likely to care about health codes. “Oh, you’re absolutely right,” she says. “Why is the weapon sent off somewhere?” I ask. I say that makes sense. Somebody who works there. Not here. We aren’t talking about here, about This Shop. We’re dealing with fiction, telling stories. Our real dark chocolate swirls around, unmolested, in the pot. “Who’s your somebody?” I ask. “Don’t ask me. You’re the writer. It’s your somebody,” he says laughing at his clever deflection of my question. He goes back to wiping chocolate off the enrober’s conveyor belt. “But a crime would be fun,” Olivia says. “She’d change it so it wouldn’t be about us,” Helen assures everyone. Every time I see Olivia, she wants to know if she’s in the book yet. “There is no book yet. I’m still thinking.” She gives me a look that says, How long can it possibly take? You’ve been working here for weeks. “I’m still gathering material,” I explain. “You can’t use it on your resume,” I say. She rolls her eyes, indicating she’s extremely well aware of that fact. She tells me I can use the name June for her in the book, if I want. That’s her middle name. “I like the idea of becoming fictional,” she says. Then she wants to know what I still need to figure out in order to start writing the book. What I don’t say is, my idea was never to set a novel in a chocolate shop, but only to get a sense of the place so that I could have a character credibly work there, so I could describe her job, if I chose to put that in. Sometimes a character’s work life is center stage in a novel. Sometimes, it has no bearing or can be taken care of in a single sentence, a mere passing reference. “Have somebody who works in the shop go berserk,” Olivia suggests. She laughs. “It could be,” she graciously offers. I ask her what she does when she’s not here. When she’s not in school. “I hang out in cars,” she tells me. Probably the Amoco station out on Route 35. There, on most summer nights, you can see teenagers lounging on cars, sprawled across the hoods, or sitting cross-legged on a trunk. But mostly, merely leaning up against the metal in alternating boy-girl, boy-girl arrays, arms draped across one another’s shoulders, cigarettes hanging from their lips. I want Olivia in my book. I want her leaning idly against a car, laughing, not with glee, but with dark knowledge, close enough to the gas pumps to smell the fumes when the wind shifts, and far enough so that the station manager never has to ask her to extinguish her cigarette. Olivia, I decide, hangs out on the car farthest from the road. The one that’s well over on the side of the gas station, out of sight of the main drag. Just in case her mom happens to drive by. “I’m still thinking,” I tell her. I have no idea what my next novel will be about. I’m hoping I’ll find something for Olivia/June. A small walk-on, probably, though I hold out hope that we’ll both get lucky; that I’ll find her voice when I’m back at my desk, and she’ll capture the lead.